Levels/Priorities with option to disable at compile time: similar to syslog, one can specify levels such as critical, error, warning, information or debug. An added bonus is that you can compile-out messages above certain levels, removing the function call overhead and the strings from the binary. Logging domains: one can create multiple domains aside from the global/default one, this allows for easy filtering when debugging or looking for errors. Let's say you want debug Edje, just export EINA_LOG_LEVELS="edje:4"
Comprehensive, Colorful default formatting: it will automatically turn on colors if your $TERM is supported (also works on Windows). Output includes PID, log domain, file name, line number and even thread ID if that's different from the main thread. Some of the components can be toggled with environment variables. The benefits of writing with eina_log instead of adding printf() is that you can more easily filter the output and you can keep the debug information there, without extra impacts. Often people that add printf() will forget them and pollute everybody's else output, eventually clashing with user-output (if printf()/stdout and not fprintf()/stderr). Or they remove and when someone else run into similar bugs and needs to walk the code and think all over again on where to add logs to figure out the problem. Then it's best that the developer who writes the code leaves proper debug messages with key variables/values, for future debug help. It starts as usual initializing Eina, then sets our function to be used as print callback, then uses the standard macro that logs to the global domain. Our function is also pretty simple and easy to understand. Simple Log just our domain to Stderr: How about if we just want the simple output for our application domain, leaving all others with Eina's standard eina_log_print_cb_stderr()? 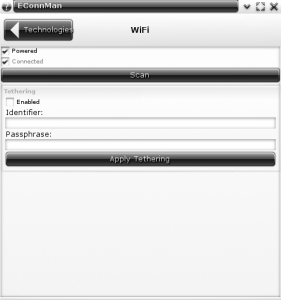 This was required by edje_cc tool. It's just about using the const Eina_Log_Domain *d parameter! 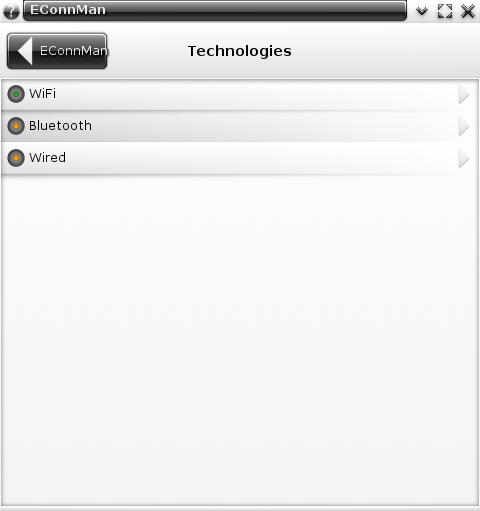 Today I'm releasing the first release of "econnman", the EFL user interface for ConnMan. Then our developer Lucas De Marchi proposed to do the libmodprobe and we funded it. After some discussions with Lennart and Kay, it was decided to rename it to kmod for shortness and good namespace. The initial goal was to achive a 1:1 replacement of module-init-tools as a library to be used by udev and systemd-modules-load and we are close to it with our second release done today! While we miss depmod tool (planned for v3), our kmod-modprobe should be fully functional and if this proves to be true, the logic will move to libkmod to be used by udev. Being a new project in a critical area of Linux system, we expected lots of criticism and rejection by people, but interestingly enough after Lucas' announcement and LWN article the feedback was highly positive! We even had some testers and people to help with ideas and experience. Among the people that joined the project is the current maintainer of module-init-tools package Jon Masters, which announced that kmod replaces module-init-tools. He is helping a lot with his knowledge and cases from Red Hat Enterprise Linux, also providing modules from non-trivial platforms such as s390. Last but not least he provided insights to improve module handling on Linux, particularly replacing modules with better alternative as required in enterprise systems. With Jon's blessing we'll use the same mailing list linux-modules@vger.kernel.org and our git will move to kernel.org soon. People from ARCH and Debian were also interested and even created packages for it! These guys were extremely helpful to test cases such as gzip modules, 64bits modules with i386 user space and so on. They are: Tom Gundersen (tomegun), Dave Reisner (falconindy) and Marco d’Itri (Md). create unittests and measure coverage. Given kernel modules are user-input they may be broken files and libkmod-elf.c needs to be extensively tested to avoid segmentation fault due out-of-boundaries access. This mean not trusting null terminated string in .strtab section and so on. create optimized modules.archive that would contain optimized search index and all modules compressed independently, but in the same file. This would save file access and could provide information we don't have today, like the uncompressed size of gzipped modules. Python em sistemas embarcados: Sim ou Não? Last but not least, I'd like to thank everyone that did this amazing conference possible!